Sunday’s Super Bowl LIII between the New England Patriots and Los Angeles Rams will feature eighteen players who were once standout performers at Catholic high schools across the nation, including eight from programs ranked during 2018 in the Catholic Athletes for Christ Top 25. St. Thomas Aquinas (Fort Lauderdale, Fla.), who were positioned at number 9 in the final CAC Top 25 ranking, boast three alumni who all expect to see significant action at the Mercedes-Benz Stadium. 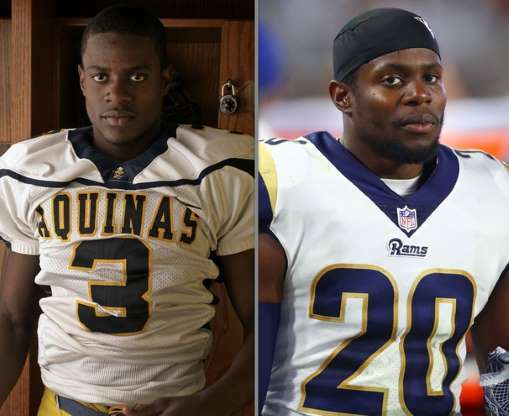 Running back James White and wide receiver Philip Dorsett will line up for the Patriots, while starting in opposition on the other side of the ball will be former high school teammate Lamarcus Joyner at free safety. Joyner will play in his first Super Bowl after five seasons with the Rams, who selected him in the second round (41st overall) of the 2014 NFL Draft. He has recorded 260 career tackles (191 solo) with 4 sacks and has snared three career interceptions. Joyner played his senior high school year for the St. Thomas Aquinas Raiders under coach George Smith, where he was a shut-down cornerback as opponents stayed away from his side of the field. He also starred on special teams, averaging 39.6 yards per return including three kickoffs returned for touchdowns. Offensively, he recorded 1,090 all-purpose yards on just 79 touches, scoring four rushing and four receiving touchdowns. Named the National Defensive Player of the Year by USA Today, he was ranked as the best cornerback prospect in his class before committing to play at Florida State. Standing in Joyner’s way on Sunday, in addition to former teammates White and Dorsett, is a quarterback hoping to lead the Patriots to a sixth Super Bowl win – the incomparable Tom Brady. Regardless of the outcome of Sunday’s game, whether it’s Joyner or White and Dorsett, at least one former Raider will leave Atlanta with a Super Bowl ring. The Catholic Athletes for Christ Top 25 High School Football Rankings, presented by Siena Heights University and Global Football are released on Wednesdays throughout the high school season. Criteria include the quality of the team and its players, strength of schedule, tradition, and quality of the team’s league, conference, region or district. The rankings are compiled by Christopher Lawlor, an award-winning writer, who is a voting committee member and advisor for several major national high school events. All Catholic high schools from the United States that feature only four-year players on 11-man teams are eligible for consideration.